Interesting Facts Lucky In Love was most likely a test piece or a limited release item. The Lucky In Love design is printed on the one-quart Round Casserole (473) and remains one of the most elusive Pyrex designs ever created by Corning Glass Works. Released in 1959, Lucky In Love is most likely a limited release product or even a test piece. The design is of green grass with clovers running along the bottom of the dish and pink hearts interspersed throughout the middle of the dish. 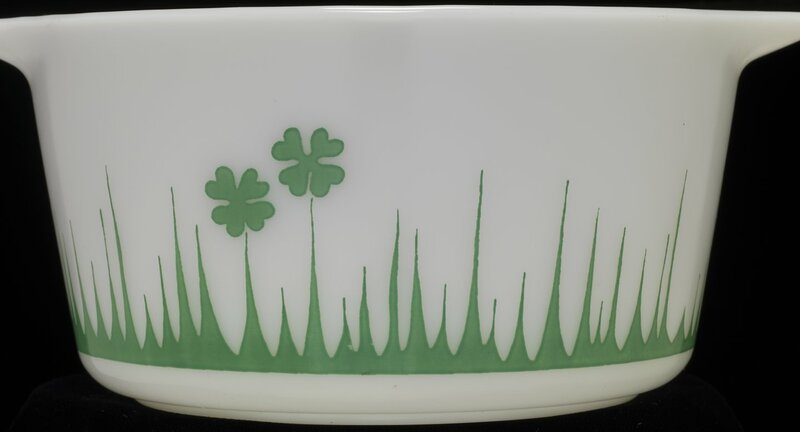 The one owned by the Corning Museum of Glass is unique in that there are no pink hearts on the design, only the green grass and clovers. Recent online auctions have seen Lucky In Love sell for over $4,000.